HIGH POINT, N.C. – The High Point Rockers are set to begin play in their inaugural season in just 100 days and today announced the addition of three players to their 2019 roster. Breland Almadova, Josh Mazzola, and Nick Sarianides join Matt Sergey on the club’s inaugural roster. Both Almadova and Mazzola were acquired via trade while Sarianides was signed as a free agent. All three players have extensive experience, including winning league championships at one point in their professional careers. Watch Rockers Manager Jamie Keefe Talk About His New Players! Acquired from the Sussex County Miners of the Can-Am League for a player to be named later, Almadova adds a burst to the Rockers lineup; literally. 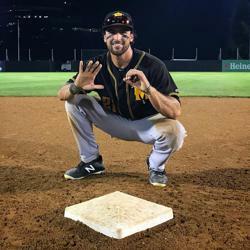 The 28-year-old outfielder set a Can-Am record with 51 stolen bases in 2018. 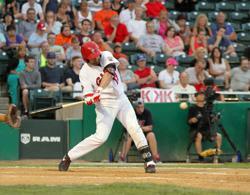 He also posted a .382 on-base percentage, en route to helping the Miners win the 2018 Can-Am League title. Entering his eighth season of professional baseball, the Hawaii native was drafted by the Arizona Diamondbacks in 2012 and played four years in their minor league system, winning a Pioneer League championship in 2012. The Rockers also sent a player to be named later to the Winnipeg Goldeyes of the American Association, in exchange for veteran infielder Josh Mazzola. Entering his 12th year of professional baseball, Mazzola has a career batting average of .281 and a track record of being a quality run producer. The 32-year-old has driven in at least 57 runs in each of his last seven seasons. This won’t be the first taste of Atlantic League action for Mazzola as he spent time with the Somerset Patriots in 2016, batting .304 in limited action. He joins the championship quality being put together by Keefe, having won an American Association title in 2012. In addition to the two bats, Sarianides becomes the second arm to officially join High Point. This will be the 11th season of professional baseball for the righty, who spent his first three years in the Cleveland Indians farm system after being drafted in 2009. In 2016, the 29-year-old split his time in Double-A, first with the Mobile BayBears in the Diamondbacks system before joining the Chicago Cubs organization with the Tennessee Smokies with a combined record of 3-3 and a 3.62 ERA in 30 appearances. Most recently, Sarianides pitched for Keefe with the Rockland Boulders to a 2-1 record and a 2.98 earned run average in 12 total appearances over the 2017 and 2018 seasons. He also has championship experience, winning a Midwest League title in 2010 with the Lake County Captains, giving every Rockers player currently on the roster a championship ring. The three join 2018 Atlantic League champion, Matt Sergey, on the roster as High Point continues to grow their team in anticipation of Opening Day on Thursday, May 2nd at BB&T Point. With only 100 days left until the first pitch is thrown, fans can still guarantee their seats to the historic first home game by placing a $50 deposit on season tickets by calling (336) 888-1000, sliding to HighPointRockers.com, or by visiting the team offices at 214 Lindsay Street in downtown High Point.